It only makes the job better for a practice and ultimately eliminates chances of rejections by following the claims adjudication mandates with a detailed inquiry that clears the air about a patient’s insurance eligibility. Reducing in house billing costs and improving on prior authorization priorities will ultimately depend on a powerful and proactive prior authorization service. 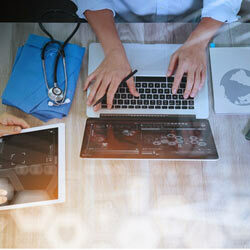 It is pertinent for a medical practice today to find a partner that assesses the immediate payer requirements, complies with it and gives an edge to the auth request by engaging robust technology interfaces providing smart automation in all accounts. Patients bear the brunt of the lengthy prior authorization process. Gaps in medical procedures, prescription cancellations become a huge pain for both healthcare providers as well as the patients. It is crucial for the providers to ensure active steps and implement the right methodology that will help them eliminate proven challenge areas with everyday practice management. On an average almost $869 million hours get spent on just obtaining prior authorization. The annual cost of prior authorization is worth $31 billion. Versatile across all major practice management/ billing systems, we are your best chance for a streamlined prior authorization plan of action. We have developed our proprietary platform "Prior Auth Online" which is simple, linear as well as reliable to provide you with the needed support. Let our team provide you all the information, share with you, our functional best practices on what difference we put across the table as your ultimate healthcare revenue cycle management partner.